Born in Johnstown, New York, to Daniel Cady (later a judge and congressman) and Margaret Livingston, Elizabeth Cady was educated at Johnstown Academy, the only girl in the higher classes studying Latin, Greek, and mathematics. Barred from obtaining a college degree because of her gender, she continued her studies at Emma Willard’s academy, where she discovered natural rights philosophy. She read law with her father and was moved by the systemic discrimination against women in every aspect of life. In 1840, she married abolitionist Henry Brewster Stanton with wedding vows that notably excluded the then-customary promise to “obey” her husband. 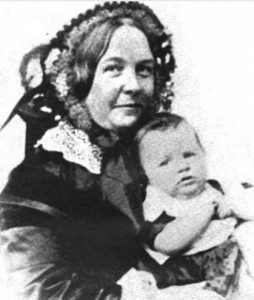 For their honeymoon, Elizabeth Cady Stanton and her new husband journeyed in June of 1840 to the World’s Anti-Slavery Convention in London. When women delegates were denied seats, Stanton and Quaker activist Lucretia Mott (who was also consigned to a viewing gallery) were inspired to work for a convention in which women would demand their own rights. In 1848 in Seneca Falls, New York, Stanton joined with Mott and three other Quaker women to convene a gathering that is often considered the founding of the women’s rights movement in America. Stanton drafted the Seneca Falls Convention’s Declaration of Sentiments. Patterned after the Declaration of Independence, it included the words “We hold these truths to be self-evident: that all men and women are created equal.” She also drafted the resolutions adopted at the convention which called for the ballot—a radical idea opposed by her husband and even Mrs. Mott. It was shortly after the Seneca Falls Convention that Elizabeth Cady Stanton met Susan B. Anthony of Rochester. The two formed a lifelong friendship, strengthened by their mutual devotion to women’s rights and women’s suffrage. They spoke at national women’s right conventions, testified before legislatures, and founded both the National American Woman Suffrage Association and the National Women’s Suffrage Association to fight for adoption of a federal constitutional amendment. Stanton raised seven children and, although frequently confined to home, anticipated the day when her child-rearing responsibilities would end, and she could lecture and travel freely. A true radical for her time, she not only demanded that women have the right to vote, but also the right to higher education and a professional life. Some of her earliest reform efforts targeted laws that discriminated against married women by denying them the right to hold property, keep their wages, and have guardianship of their children. She was instrumental in the passage of New York’s Woman’s Property bill. Her agenda was more extreme than that of younger, more conservative advocates, and extended to a belief that religion subjugated women. Up until her death at 86, Elizabeth Cady Stanton, spent every afternoon with a private secretary dictating correspondence and writing highly popular newspaper and magazine articles. An obituary and accompanying articles in The New York Times noted that her death “fell with almost crushing weight” on Anthony, who called her “the philosopher and statesman of our movement.” It’s a tribute that has endured for generations.